As you all know, it is the swimmer’s responsibility to obtain the required documentation for meets held outside the USA. The meet host is responsible for documenting any FINA Masters World Records but will have no knowledge of USMS Records. However they are usually very helpful especially, if done during the meet. 1 – Check with the USMS Records person, Mary Beth Windrath, to see that the pool measurement is on file with FINA. The pool length must be confirmed before any swims can count for USMS Top 10 or USMS Records. 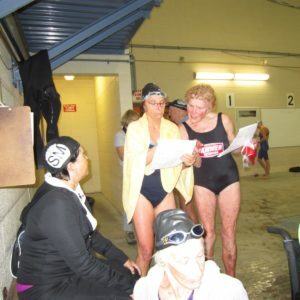 2 – Look up the current USMS records for the events you are going to swim to see if you might break any records. Remember to include records for possible splits. 3 – Get copies of the USMS Record Application from the USMS Website and take them with you to the meet. 4 – After the race, immediately check the results for your race including the splits. 5 – If you broke the USMS records, fill out a USMS Record Application for each potential record and take it to the meet referee. 6 – You will be asking him/her to sign the application, and get you a copy of the timing system sheet. 7 – Submit to your LMSC Records/Top10 person, the results of your swims for USMS Top10. Include the meet location, date and name of the pool. 8 – Also submit any USMS Record Applications with required documentation.